Some of the most popular podcasts today are about murder or tabletop roleplaying games. While it’s not the only show of its type, The Adventure Zone has grown a large and enthusiastic audience, large enough to (hopefully) support a published graphic novel. The Adventure Zone: Here There Be Gerblins (First Second) is based on one of several campaigns that the McElroy family has undertaken together on their podcast, The Adventure Zone. The experience of reading a novel based on a roleplaying game with four participants could have been a messy and confusing one. The McElroys are practiced storytellers, with a stable of different podcasts to their names, but translating audio from four people into art isn’t easy. It helps that Griffin McElroy, the youngest brother and the group’s dungeon master, is given a chance to offer asides and commentary throughout the story. It’s like editors notes in classic superhero comics but with a bit more mockery and some serious frustration when the players aren’t acting as he expected them to. It provides context for the adventures on the page and roots the experiences in something familiar; it feels a lot like Peter Falk’s role in The Princess Bride. While Griffin and the other two McElroy brothers contributed to the story that the graphic novel is based on, it’s their father Clint who worked with artist Carey Pietsch to adapt it, and they deserve a lot of the credit. Pages are full but rarely overcrowded. 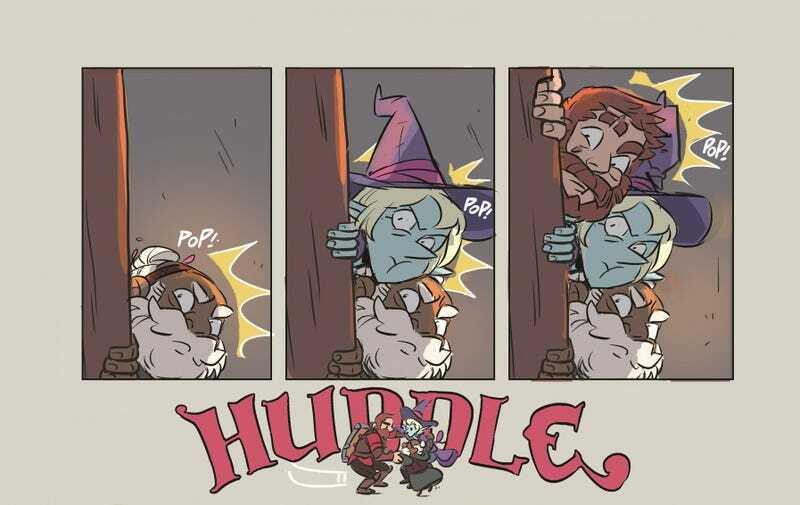 As a podcast, The Adventure Zone has to rely a lot on verbal descriptions and dialog to fill in the details, which Pietsch excellently translates into visuals. There are some pages that are heavy with text and a little overcrowded, but they tend toward the front of the book where characters are introduced and the world is established. From there, Pietsch expertly draws facial expressions from the tone of voice used in the podcast, taking lines directly from the show and creating vibrant, colorful panels to replace or enhance them. It’s particularly impressive that she did all of the coloring herself as well, with flatting help from Niki Smith and Megan Brennan. 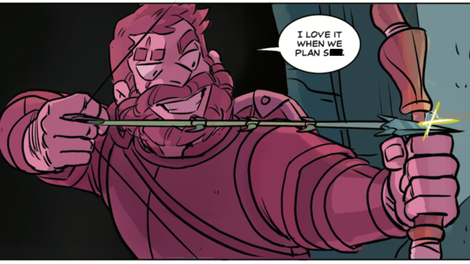 The character designs are detailed and consistent across chapters, and Pietsch has a real skill with cartoonish and overblown facial expressions that perfectly capture when the McElroys go off the rails in audio. The story itself comes from a standard campaign; for readers unfamiliar with tabletop roleplaying it may feel absurdist, but giant spiders and guys with names like Barry Bluejeans aren’t uncommon. It’s easy to read and keep up with, and showcases the joys and challenges that come with this type of roleplaying game. Still, readers who have never listened to the podcast or played a game like this won’t have any trouble diving in and embracing it. While long-term listeners will find pleasure in the character development and knowing about the emotional connections that get made as the show has progressed, Here There be Gerblins focuses much more on world-building and racking up laughs than attempting to explore anything particularly heartfelt. McElroy fans will absolutely want to pick it up, but it’s also something that readers who love Squirrel Girl and Giant Days should grab. The McElroys’ storytelling strength has long been in their humor, and this is a good introduction to unexpected and sometimes almost Dadaesque way they pull laughter out of thin air.